Hello, my name is Alison Mills, welcome to my website. I am an experienced soft goods designer, maker and product developer, working for the toy and general product industries. I fulfil a variety of roles for my commissioning clients, and according to their wishes I can create concepts or completed designs, carry out product development to final production, source fabrics, and make patterns and samples as required. I design and make anything from fully dressed toys (Doctor Who, Everything’s Rosie, World Cup mascot 2010) to more unusual items such as the Horse Hoof boots. I have appeared several times in The Apprentice (BBC1) as a supplier, making products for the teams for their weekly task. 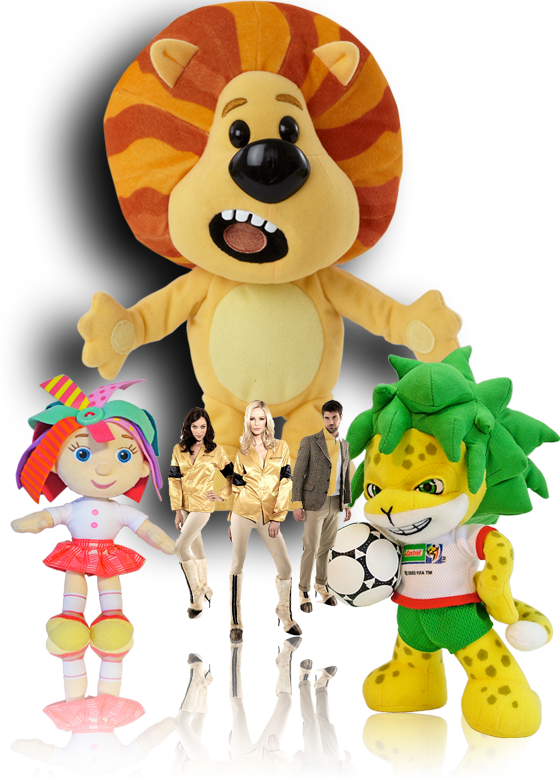 World Cup mascot, Olympic mascot 2012, Mike the Knight, Everything’s Rosie, Raa Raa, Doctor Who, Cyberman, Dalek, Daniel Craig as James Bond, Harry Potter, Madagascar, I Love Pony, Animagics, HMAF, Victorious, Crayola, Harry Hill’s Knitted Character, Little Britain, Sindy Doll, Scooby Doo, Alberon, Pleasant Company, Spot the Dog and Buggy Boot. Please use the navigation bar above to browse the rest of my site. "I’ve worked with Alison for over eight years on projects ranging from dolls to action figures and plush; her skills as a designer and seamstress of miniature clothing are exceptional and are complimented perfectly by her ability to render any licensed character as a cuddly toy!" Edmund Barnett-Ward, Director of Sculpting, Designworks of Windsor.